We welcome you to Put-in-Bay and Island Club Rentals. Put-in-Bay is located in beatiful Lake Erie in northwestern Ohio. Put-in-Bay is also known as South Bass Island. The Island Club consists of 73 fully furnished homes available for rent. The homes feature three or four bedrooms, two baths and a equipped kitchen. Also, each home has an outdoor deck complete with a propane grill. Guests can also take advantage of the new pool installed in 2008. There is ample space to layout and catch some Put-in-Bay rays and a Lake Erie swimming area to beat the heat. If you would like to make a reservation at any put in bay property, go to the Reservation Request Form. We are your Put in Bay Resorts headquarters! Put-in-Bay parks provide wonderful oppurtunities to uncover the natural wonder of the Lake Erie Islands. Also, there are numerous activites that can be enjoyed on Put-in-Bay including fishing, watersports, bird watching and kayaking. All across the Island there are preserved lands that are designed to protect and educate about the Lake Erie wildlife and vegetation on Put-in-Bay. Explore the parks on PIB and find the natural wonders of the Lake Erie Islands. Find your perfect Put in Bay Address. South Bass Island State Park is located at the end of Catawaba Rd., near Meechen Rd. There are 10 full service and 125 non-electirc campsites available at the put in bay state park. Some campsites are pet friendly, for those who don't want to leave their friends at home. Bathhouses provide restroom facilities and showers for guests at the park. A fishing pier provides a great perch to try your chances for Lake Erie Walleye. Anglers can also catch catfish, yellow perch and Lake Erie small mouth bass seasonally from this dock. For a more in-depth look at Lake Erie there are watercrafts available for rent. Aboard a jet-ski riders can take in panamoric views of Put-in-Bay and Kelley's Island with the fresh Island breezes blowing about. PIB is primarily composed of limestone, and thus the beach at the park is rocky. Still, vistors can swim here and cool off on a hot day. The grounds at SBI State Park are naturally stunning, with excellent habitats for birds and wildlife. Their is ample Lake Erie frontage with limestone cliffs around the perimeter. The bird watching at the park is some of the best to be found on Put-in-Bay. Oak Point State Park is also part of Ohio's Parks, and provides transient docking. Tent sites are available at this park located on Bayview Ave., near the Ohio State research labratory. Put in Bay dock rental has many options. We look forward to bringing you more Lake Erie information on them soon! 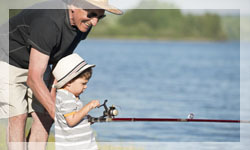 Put-in-Bay parks have many activites for everyone in the family. Whether seeking out a rare migratory bird or swinging in the playground, you will surely enjoy your time spent. Fresh Lake Erie breezes and sunny summer days make for wonderful memories. Explore a Put-in-Bay park on your next visit and love nature "island style"! By choosing the Island Club you provide you and your group an opportunity to stay together, and have the space and comforts that a hotel simply cannot provide. Also, the costs are either cheaper or comparable to the hotel rates, without sacrificing your privacy and space. We can accommodate very large groups, and pending on availablility, be able to put groups in neighboring homes. You can rent an Island Club Rentals home by the week, weekend or during the midweek. Be sure to check out the incredible mid-week specials to plan your cost effective Put-in-Bay vacation. There is a wonderful dichotomy of the action that Put-in-Bay sees. From Sunday through Thursday, the island with its natural beauty and tranquilty can be fully enjoyed. The pace is very relaxed, and one can often find more families on golf carts and children on bikes than automobiles. The weekends at Put-in-Bay are action packed with many live entertainment options and an exciting night life. Throngs of people come to stay for the weekend on Lake Erie, and others for the day via the Jet Express. Both during the week and on the weekend provide vacation opportunities for everyone's liking. Whether you prefer the slow paced atmosphere of the midweek or the intensity of the weekend, Put-in-Bay has both. And Island Club Rentals ready to accommodate you and yours during your next trip to Put-in-Bay. Click Here to make a Reservation now!!! Put in Bay dockage has many put in bay marinas options for your put in bay boat. We look forward to bringing you more information on them soon! As well as Lake Erie motels! The South Bass Island State Park at Put-in-Bay is great for an exciting, adventure-filled day. Complete with 120 non-electric camp sites and 11 full service campsite areas, the campground is equipped to accommodate your every need and fills very fast. And don't forget, the state park is pet friendly! Let your dog enjoy Lake Erie! The South Bass Island State Park also offers sheltered picnic tables, watercraft rentals, a limited fishing supply store, and a playground for kids to enjoy. Guests at the South Bass Island State Park are more than welcome to enjoy poolside fun at the Island Club. In fact, if you do not wish to sleep on the ground, with all the bugs, in the oppressive heat of summer (because the campgrounds have very little air circulation and it gets very hot and stuffy), then please consider a very affordable Put-in-Bay home rental at the Put in Bay Island Club or with one of our Island Club home rental partners! Put in Bay Island Club has home rentals for 8, 10, 12, 14, and 16 guests. Our Lake Erie Island Resorts are perfect for everyone! So, don't get separated from your group by staying in separate hotel rooms or sleeping ont he ground in a tent... opt to stay together at the Island Club. 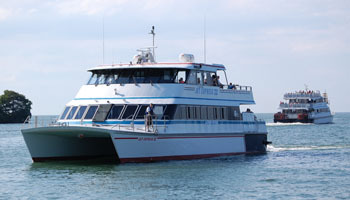 The relaxed nature will surely improve your Lake Erie adventure. Check on Rates and Availability, or reserve your vacation rental at our Reservations Page. If you are interested to see what great live entertainment is offered, head on over to the Calendar of Events. If you are interested in checking out other available homes and cottages, go to our More Lodging Page. We look forward to serving and seeing you at Put-in-Bay this year! If you have any questions about Put-in-Bay or would like more information please call 216-898-1105 or email us. We will SEE YOU AT THE BAY, at the Island Club at Put-in-Bay, Ohio.